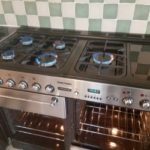 For the freshest start to 2019, book your oven cleaning Hereford New Year appointment. Rid your oven of all that Christmas turkey fatty mess, and enjoy positive, sparkling, and spotless cooking. Always a breath of fresh air. Oven & Range Cleaning are proud to be your local independent, professional oven cleaning service. We cover Hereford, and live locally. We are family-run, and our values are to be polite, punctual, and professional at all times. Our system is unique. We work right by your cooker, keeping out of your way, unlike other companies who work from vehicle-based soaking tanks. (Front door open in all weathers, unsafe for children and/or pets.) Our method is much less disruptive for the customer, and you can relax knowing there will be no muddy footprints in the hall! We are happy to discuss customers’ requirements and answer any queries about the way we work. Why not give us a call, and see what we can do to help bring a fresh start to your kitchen.